The recovery of Bitcoin prices depends on adoption levels and favorable regulations. While we are bullish, buyers are free to ramp up once we see strong gains above $3,800. Before then, traders should take a wait and see approach. There has been much debate around Bitcoin. Often, the discussion revolves around the ability of Bitcoin to perform as billed. That is to act as a peer to peer electronic cash payment solution as stated by the founder, Satoshi. However, with time, it is increasingly becoming clear that the network won’t handle influx of users as we saw at the peaks of late 2017. What remains after Segwit 2X is an off-chain scaling solution that is fast, secure but not trustless. The Lightning Network is off-chain, but proponents assert that Bitcoin will at the end of the day evolve into a settlement layer. A store of value platform with micro-payment executed in these scalable hubs called the Lightning Network whose use is picking up. The promise of making off-chain payments doesn’t bode well with many, but that is the current state of affairs. It may even be the only thing that will spur involvement as merchants and individuals pay for day to day goods or services. That will surely prop prices which are down 2.8 percent in the last week but stable in the last few hours. Nevertheless, our optimism is founded by positive fundamentals. In the short-term bulls may be in control. However, the path of least resistance will be southwards if buyers fail to support prices by today’s close. We reckon that any drop below last week’s low at $3,400-500 could trigger meltdown driving prices towards $3,200 and even $1,500 assuming bears step up. On the reverse side, our medium-term trajectory will be correct if buyers soak bear pressure, helping catalyze a comeback that will see BTC reverse losses of Jan 28. Before then, we recommend taking a neutral position. Jan 28 bear bar with 17k versus 12k in volumes—streams from BitFinex, guides our trade plan. With near flat market participation, gains above $3,600 and consequent confirmation or nullification of Jan 29-30 double bar bull reversal pattern depends on volume surges above 17k on the lower limit. Ideally, confirming bars should have high volumes above 20k. If instead there is a spike—above 20k, but prices drop below last week lows, we could see a sell-off towards $3,200 or lower. 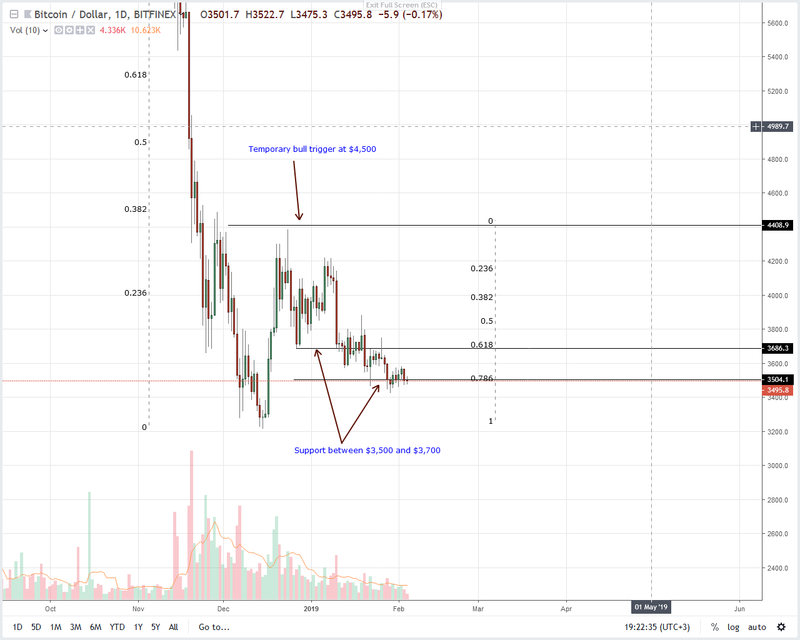 The post Bitcoin Price Analysis: BTC Transaction Volumes “Very Low” appeared first on NewsBTC.